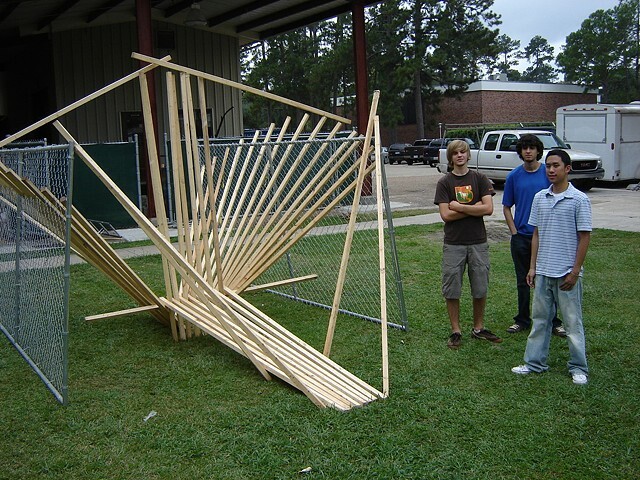 Each student brought five 8 foot 2" X 2"'s at the beginning of the semester; throughout the semester when students did not come to class prepared I would send them out to 'build something interesting' with the boards. They could not use any fasteners (nails, glue, tape, etc. ); they could not alter the landscape in any way (or create a hazard). Their goal was to activate space with a 3D line. They were also allowed to utilize two sections of chain-link fencing that were propped against the sculpture building.